Those with unruly hair often find themselves in a bind without the right tools and products to help tame it. No matter how much money you spend, how hard you try, and how much time you dedicate – combatting uncooperative frizz is always easier said than done. Could it be that you're using the wrong products? Hair care is what you make it: without the appropriate tools, you will struggle to make it work and will be incredibly limited on styles. At HSI Professional, we provide high quality salon styling products to consumers all over the world. Our product line is growing by the day, as is our customer base. Our products are among the best in the industry, we ship with lightening speed, and our customer service is top of the line. There's simply no justifiable reason to look elsewhere for professional products suited perfectly for uncooperative hair. What types of products do we offer? Our hot irons are some of our best sellers: for straight hair we have curling wands, and for curly hair we have flat irons. Where does frizz even come from? Are some people just born with more than others? In fact, while some hair might be more prone to stubborn frizz, the fact of the matter is that everyone is susceptible to it if they don't take their hair seriously. The unsightly, stubborn frizz you battle every day is just a result of dry, damaged hair: split ends, broken strands, static electricity. Certainly you remember a time when it didn't look so bad... so how could it have come to this? It all comes down to consistency in your routine: the more you use high heat on your hair – specifically using cheaply made flat irons with limited technology – and the more you avoid using heat protectants and other products, the worse your hair will get. So if you do have curly hair and you have the frizz, what gives? Are you stuck with curly hair for life? Not so. All you need to do is invest in a high quality HSI Professional flat iron that will work wonders on your hair while promoting optimal hair health. Flat Irons are a dime a dozen these days – they litter the shelves in big box stores and grocery stores alike. So what makes HSI hair straightener better? At HSI Professional, we offer the Glider Elite Professional, the Glider + Tourmaline Digital Flat Iron, and the Glider Ceramic Flat Iron. Each of these straighteners use HeatBalance technology with 8 micro-sensors to regulate the temperature and evenly distribute heat. They also have ceramic tourmaline-infused plates for anti-frizz control, and temperature control to prevent hair damage. What does all of this mean for your hair-straightening experience? It means that fewer passes with the flat iron are needed through your hair, which cuts down on your hair exposure to extreme heat, which is the best way to ensure efficiency while cutting down on frizz and maintaining great hair health. Maybe curly hair isn't your problem. Maybe you can't quite wrap your mind around using that curling wand you picked up at the drug store last month; all it does is burn your fingers, your scalp, your hair, and it doesn't even curl your hair. 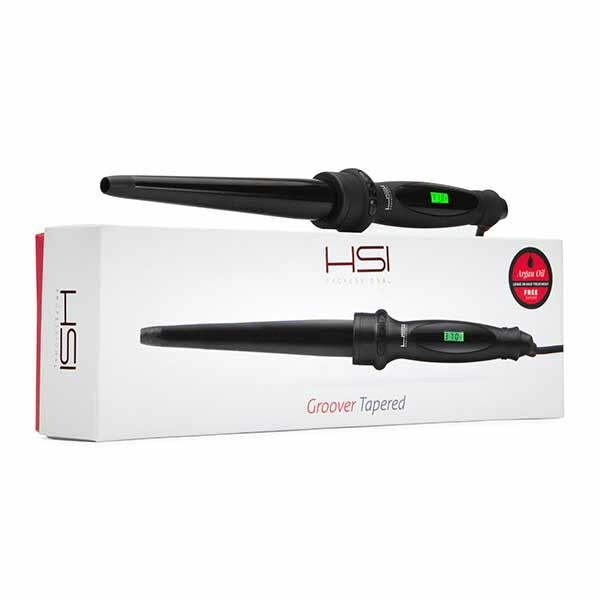 If you battle stick-straight hair and are dying for some big, bouncy, frizz-free curls, our HSI Professional curling wands are what you need. Our Groover Tapered Curling Wand and Groover Curling Wand are 1 inch ceramic curling wands with digital LCD, are more moderately priced, and are easy to use. his product can be used as a serum for conditioning to give you optimal final results, as its infused with highly concentrated antioxidant rich argan oil and shine boosting vitamins. Our heat protectant hydrates dry hair, detangles those tough spots, speeds up drying time, boosts shine and creates a protective barrier between your hair and high heat styling tools. Our professional heat protectant is safe for color-treated hair, it's sulfate-free, phosphate-free and paraben-free. Should You Use A Hot Iron On Damaged Hair?